Unquestionably, Tom Tierney deserves to be known as the King of Paper Dolls. 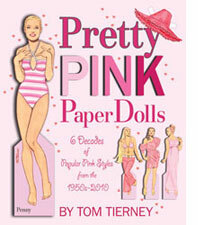 For decades his prolific output of books has made him the most successful paper doll artist of all time. Fashion, history and glamorous celebrities are favored subjects of the octogenarian artist. If his paper doll books were to be stacked up, they would tower over the man himself, a handsome, compactly built figure whose sparkling personality is larger than life. Tom Tierney is the best known paper doll artist in the world, but he didn’t begin this chapter of his career until 1974 when “Thirty from the Thirties,” a book of Hollywood stars was published. He had originally created it as a gift for his mother. At the time, Tom was enjoying a phenomenal success as fashion illustrator. His career began in Texas, his home state. He had drawn extra clothes for his cousin’s paper dolls and that launched his interest in fashion illustration. Tom studied with fine teachers and graduated from college with a degree in Fine Arts. A stint in the army did nothing to slow down his pursuit of art. He painted a four star general’s portrait and did posters for the WAACs during the day and freelanced fashion illustration at night. When he moved to New York City in 1954, Tom rose to the top of the ranks in commercial fashion illustration. Because of his serious fine art training he was equally comfortable drawing women, men and children. Not only that, but he was so adept that he could imitate other artist’s styles, a valuable skill in the heyday of commercial art. Purposefully, Tom did not sign his art so that he could work in different styles for different clients without any conflict. At one time, he even managed to juggle Macy’s and Gimbels, famously antagonistic competitors. Not content with his successful art career, naturally charismatic Tom took on show biz. He studied dance and singing, developed and debuted a nightclub act and then decided that performing took too much time away from his drawing board. As the popularity of fashion illustration began to wane, Tom Tierney almost single handedly revitalized the lagging paper doll publishing business. 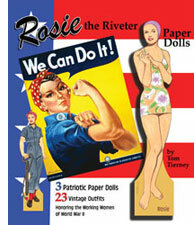 He published two books of paper dolls, “Thirty from the Thirties” and “Attitudes.” Then in 1978 connected with Dover Books where he produced scores of popular paper dolls. His subjects included movie stars, fashion designers, presidential families and a series that chronicled fashion history as worn by an American family, all rendered in his instantly recognizable style with strong, supremely sure line. His own website lists almost 350 previously published works! The latest chapter in Tom’s incredible career is the collaboration with Paper Studio Press. Publisher Jenny Taliadoros says, “Having Tom Tierney join my stable of talented artists is a genuine thrill because he brings his incredible experience, his great talent, his knowledge of fashion and his never-ending enthusiasm.” Tom's current titles for Paper Studio Press include Rosie the Riveter, History of Denim, Fun With Grandma, Stopover and Pretty Pink Paper Dolls.